It’s so hard for kids to wake up early in the morning to get ready to go to school. Parents know this struggle all too well, and we were all kids once. We can all relate to this. Sometimes a regular old alarm clock just isn’t good enough to do the trick. And if Mom or Dad wakes them up, they can fall right back to sleep! But who needs an alarm clock when you have a dog who is up to the task? Every parent needs a dog like Chevy! 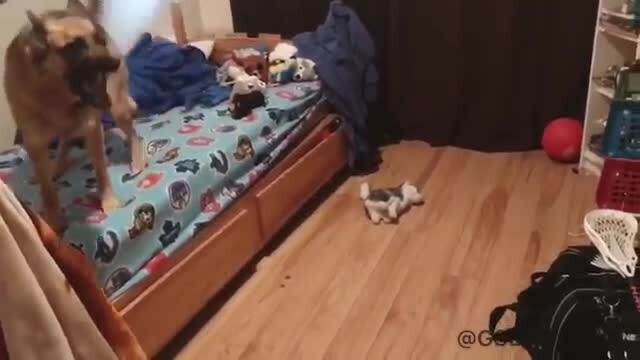 Chevy the German Shepherd is a pro at waking the kids up in the mornings. She just sits there and waits for Mom’s word, and then does her thing. The dog will take off running into each kid’s room and proceed to jump onto their beds while barking her head off! Chevy takes her job very seriously and is the best at it! What a good girl.